Julius Caesar, presented at the Stratford Shakespeare Festival, Stratford, Ontario, 6 June–17 October 2009. M. G. Aune. "Review of Julius Caesar, presented at the Stratford Shakespeare Festival, Stratford, Ontario, 6 June–17 October 2009." Early Modern Literary Studies 15.1 (2009-10) <URL:http://purl.oclc.org/emls/15-1/aunejuli.htm>. Director: James MacDonald. Designer: David Boechler. Lighting Designer: Christopher Dennis. Sound Designer: Peter McBoyle. Fight Designer: Daniel Levinson. Video Designer: Sean Nieuwenhuis. With Ben Carlson (Marcus Brutus), Jonathan Goad (Mark Antony), Tom Rooney (Cassius), Geraint Wyn Davies (Julius Caesar), Dion Johnstone (Octavius Caesar), Yanna McIntosh (Calphurnia), Cara Ricketts (Portia), Michael Spencer-Davis (Caska). 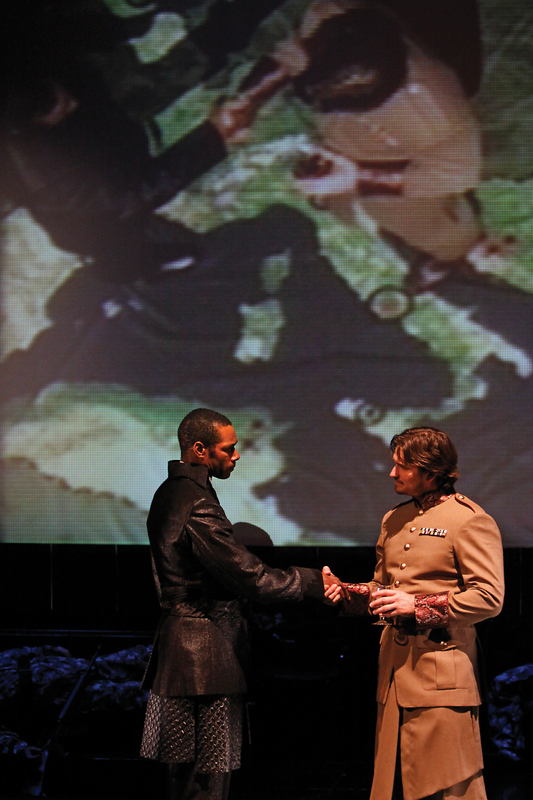 Dion Johnstone as Octavius Caesar and Jonathan Goad as Mark Antony. Photo: David Hou. Courtesy of the Stratford Shakespeare Festival. At least as well as the Romans, the early modern English knew the power of visual propaganda to influence crowds. Shakespeare makes good use of this knowledge in Julius Caesar but he also brings out the human cost of such propaganda, making the play of particular interest to an early 21st century culture saturated with politicized imagery. This production at the Stratford Shakespeare Festival explored these issues, setting the play in a roughly modern time and employing modern technology, but retaining Shakespeare’s language and Roman pagan beliefs. The Rome of this Julius Caesar was spare, clean, and cold, featuring six square columns of brown marble on a raised platform upstage with stairs that descended to stage level. This same set functioned, with some rearrangement, for the streets of Rome, Brutus’ orchard, and Caesar’s home. The second half of the play used the same basic features, but decorated as if they were ruined by war. The plebes were largely young and attired in casual, modern street clothes. Soldiers, nearly always present, were in white with red sashes and berets. The senators and tribunes dressed in what appeared to be a combination of toga and business suit: shiny satin business suits, with single-breasted coats, matching skirts and trousers, and contrasting sashes. Caesar wore a striking white, military version of the suit, decorated with epaulets, medals, and braids. The opening scenes swiftly delineated the world of the play. Before the curtain opened and while the audience entered, a hovering, three-dimensional profile of the historical Caesar was projected on to the curtain. Just as the lights went down, the image changed to the actor Wyn Davies’ profile and disappeared. Behind a scrim, a crowd of adoring plebes and soldiers surrounded Caesar, running riotously back and forth, as haunting piano and cello music played. Two figures brought out a sacrificial lamb and the crowd tore it to pieces as Caesar exited. When they entered, Flavius and Marullus were heavily outnumbered by the drunken plebes remaining on stage. The tribunes’ sober manner and elegant clothes set them immediately apart from the unruly, casually dressed throng. Marullus’ question about the Carpenter’s “best apparel” (1.1.8) punctuated these sartorial differences. Once the commoners dispersed, Flavius turned to the three banners of Caesar’s profile that hung between the columns, tore one down, and gathered it to him. When he turned around, he saw a soldier look at him impassively, pull out a pad of paper, and silently make some notes. The moment gave Flavius pause before he hurriedly exited and likewise struck the audience as a chilling and familiar gesture of government surveillance. This Rome was a mixture of cultures and media. The video projection and banners established the importance of visual propaganda. The bold colors and profiles inevitably brought to mind fascist visual rhetoric of the early 20th century. Other nods to totalitarianism included the crowds’ raised fists when Caesar spoke, and a gesture he made that looked very much like a fascist salute. The soldier’s note-taking reinforced this idea. Commentators sometimes observe that within the play, Caesar does nothing that might justify his murder. It is instead, the fear of what he might do that motivates the conspirators. But this moment of surveillance and the constant presence of uniformed soldiers suggested that behind Caesar’s public face, sinister forces worked to maintain his power. The characters were aware of it. When talking to Brutus and Cassius, Caska evoked the soldier’s notebook when he said gravely, “Marullus and Flavius, for pulling scarfs off Caesar’s images, are put to silence” (1.2.285-86). The production did not entirely confine itself to the 20th century, however. The devouring of the sacrifice in the first scene showed the importance of pagan practices. They were reiterated in 2.2 when servants brought the augurers’ beast, a deer, on stage so that Caesar could probe its body himself to confirm the absence of a heart. Numerous other small rituals appeared throughout the play. Cassius brought a metal briefcase containing daggers to the meeting with the conspirators. As he distributed them each conspirator ceremoniously held the dagger over his heart in a silent pledge. When the senators met, they briefly faced the audience, crossed their arms over their chests and bowed slightly. In the context of the 20th century elements, the paganism, with its ritualized theatricalism took on its own connotations of propaganda. Unlike the banners and video projection, however the rituals constituted a kind of participatory paganism. Modern technology appeared again in the second half of the play. After the interval, the curtain rose to reveal Antony, Octavius, and Lepidus discussing their alliance and their next move. A projection screen hung behind them, slightly upstage. A map of the Roman Empire was projected onto the stage floor in front of the screen and Antony and Octavius walked over it as they talked. A feed from a video camera above the stage, pointing down at the actors, was projected onto the screen. As the actors walked across the map and gestured at it, the audience could look down on them and see about what and where they were talking. Behind the screen, unlit, the set of the first half of the play looked war-ravaged. Several columns had toppled, rubble covered the stage, and half a dozen dead soldiers lay among the ruins. In their arrogance and their engagement with the video projection, neither Octavius nor Antony noticed the wreckage or corpses behind them. The map, and the characters’ interaction, with it had a distancing effect, evoking sets used by news programs to illustrate election returns or weather patterns. It fit well with the sense that this Rome was a visual culture and politicians used it to their advantage. Textually, it had curious connotations. On the one hand, it recalled Cassius’ characterization of Caesar: “he doth bestride the narrow world / Like a colossus, and we petty men / Walk under his huge legs and peep about / To find ourselves dishonorable graves” (1.2.135-38), suggesting that Antony would assume Caesar’s role as a conqueror and a tyrant. At the same time, it also foreshadowed Antony’s demise and Cleopatra’s description of his lost glory in Antony and Cleopatra, “His legs bestrid the ocean: his rear'd arm / Crested the world” (5.2.82-83). By activating this collection of related ideas, the video screen was an effective dramatic device, literally giving the audience another view of Antony. In addition, by blocking the audience’s view of most of the upstage wreckage, it brought to mind television news programs and how their strategies of presenting news inevitably occlude the entire picture. At the same time, the video projection was also distracting. Because it was the only use of video aside from the opening sequence, it stood out as a novelty. Two or three other uses of video would have made the device more familiar and more effective. Once the scene ended, the video screen rose into the flies, the full stage was illuminated and actors who had appeared to be dead soldiers came to life as part of Brutus’ camp. Wind and snow effects began, and the soldiers in their baggy gray camouflage uniforms acted cold and uncomfortable. Brutus had traded his plain brown suit for a plain gray uniform without decorations or insignia. His paunch and weary demeanor suggested that he was not a professional soldier, but an idealistic senator doing what he felt was best for Rome. His paternalism behavior also appeared in his treatment of Lucius and his insistence that two of the shivering soldiers, Varro and Claudius, share his tent. If Antony and Octavius were willing to cynically manipulate the media and the crowds for their own ends, Brutus eschewed these means, strictly concerned for the good of the individuals around him. The soldiers’ suffering and Brutus’ recognition of it foregrounded one of the production’s main themes, the suffering caused by the machinations of political leaders and mindless mobs. Shakespeare provides a shocking example in 3.3 when the crowd dismembers Cinna the poet, just because he has the same name as a conspirator. The production anticipated and contextualized this moment as ritualistic in the opening scene when the mob tore the sacrifice apart. The bloody sacrificial deer that Caesar examined not only foreshadowed his death, but also showed that the Romans were guilty of the wasteful death of animals as well as humans. Brutus the ordinary man seemed to be a focus of this theme, noble and at the same time naïve about the power of public image. Compared to Caesar and Mark Antony, he was not slovenly, but uninterested in his own appearance. He reacted emotionally to almost everything that occurred. Genuine horror struck him and he fell to his knees in 2.1 when Portia revealed her “voluntary wound . . . in the thigh,” inflicted to affirm her worthiness to keep Brutus’ counsel. Even Brutus’ death was paternal. Rather than running on to his sword as Stratos held it, he grabbed the soldier and pulled him close in an extended embrace. Antony’s arrogant and martial nature was emphasized, contrasting sharply with the homely Brutus. In a black uniform, Antony strutted through the second half of the play and flirted openly with the female soldiers. The men’s armies reflected their differences. While Brutus’ army was uniformed simply and functionally, Antony’s troops were anonymous and menacing. Faceless, they wore black helmets, opaque faceplates, and black plastic armor. Even standing still, they projected auras of potential violence. In most of the battle scenes, Antony’s soldiers’ greater numbers and black uniforms created a sense of riot police violently putting down a rebellious mob. In the play’s final scene, Antony and Octavius, surrounded by their faceless soldiers, delivered Brutus’ eulogy sincerely. After Octavius’s speech, the curtain fell, leaving the theater in a somewhat unanticipated subdued mood. The play’s surveillance and paganism had created an expectation that the post-Julius Caesar Rome was not going to be much different. Triumphant Octavius and Antony would simply pick up where Caesar left off, decorating Rome with banners of their profiles and presiding over sacrifices in their honor. The abrupt ending, however, seemed to suggest that Brutus’ actions and death had changed something, however trivial. This implied disruption of a potentially repeated narrative reminds us that the play itself is a repeated narrative. Shakespeare adapted Thomas North’s translation of Plutarch’s Lives, itself written nearly one hundred fifty years after Caesar died. Each time the story is retold, the new teller finds new ways to mediate its basic elements. Shakespeare, for example, transformed a prose narrative into a play. This production mediated that play into a type of postmodern allegory of media manipulation. The ideas of loss, ambition, and cynicism that interested Shakespeare were clearly communicated and resonated with recent history with assistance from the subtle linking of technological media manipulation and pagan ritual performance. Shakespeare, William. The Riverside Shakespeare, ed. G. Blakemore Evans. Boston and New York: Houghton Mifflin, 1997.